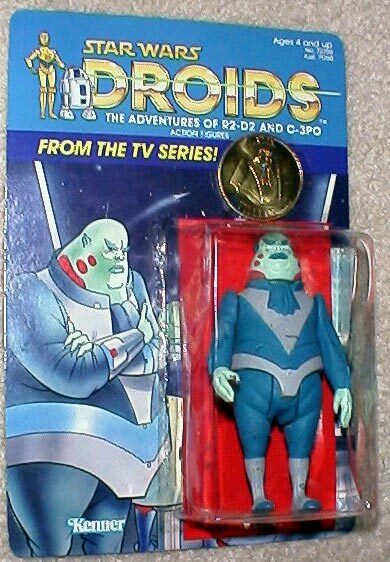 Here it is, the only carded example of the Kenner Droids Vlix known to exist. A part of the never-released second series of Droids figures, Vlix's notoriety stems primarily from the fact that it was released for a brief time in Brazil, as a part of the Glasslite company's line of Star Wars products. (Click here to see the Brazilian figure.) Therefore, not only does it represent an unproduced American toy, it can rightfully be considered the rarest Star Wars figure to ever be released commercially. But what you see here is definitely not the Brazilian release. You see, Glasslite released their Droids figures on generic cards, which depicted all of the characters together. They were differentiated soley by the presence of a nameplate sticker. But this carded sample (made using a proof card) features the blister card artwork that was planned to be used for the U.S. release of the figure. It depicts the Vlixster off to the left of the bubble, with his arms crossed and scowling. As for the figure itself, it's a Dynacast hardcopy, meaning it's freakin' heavy. It's seriously hard to keep this thing contained behind that flimsy plastic bubble. And speaking of the bubble, it's huge-- it takes a lot of space to hold a figure as big as Vlix. It's been hand-applied to the card using the standard Kenner double-sided tape. Oh yeah, the coin is also included in this package. As far as unproduced Droids figures go, it doesn't get much better than this.